Debbie's Creative Spot: Fantastic Holiday Mini! 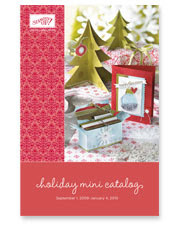 Starting today you can order from the new Holiday Mini Catalog. This is the best mini Stampin' Up! has ever published in my opinion! It is filled with many wonderful stamp sets and accessories to help you in creating cards, scrapbook pages and projects for your holiday gift giving. There are two items in the mini that are not available right now to order - My Digital Studio on page 38. That will be available Oct. 1. Also, the Simply Adorned Charms and chains are temporarily unavailable. There are quality issues that need to be worked out. I will let you know when they become available. MY DIGITAL STUDIO - available October 1. Use Stampin' Up! 's exclusive images in this easy-to-use software studio to make creating cards, photo albums, scrapbooks, and other projects even simpler! Host a workshop of at least $400 in October or November and get My Digital Studio for 50% off!! You will also get to choose a product from the Holiday Mini Catalog for $10. Call or email now to book your workshop with me! Book parties qualify as well! This is an amazing hostess special. The first 3 to book a workshop with me will receive an exclusive Stampin' Up! reusable bag with the Circle Circus design on it! Call or email now to book your October or November workshop with me. Must be a new booking not one that I already have on my calendar to receive the reusable bag. Hostess Promotion - host a workshop or book party or submit your own order in September, October or November of at least $250 and choose an item from the Holiday Mini Catalog for just $10 - that is in addition to the already fantastic hostess benefits you receive! Excludes hostess sets in the mini and My Digital Studio. This is an amazing offer! Click on the link to download and view the Holiday Mini Catalog as well as our other catalogs.